QUESTION ONE: IS THE 2000 ENGINE FAST? Yamaha has tapped into a secret that the other motorcycle manufacturers haven’t figure out–it’s not how much power you make, but how you make it. This is not the fastest engine in the 250 class, but the YZ engine could be housed in the fastest bike. How can that be? In a straight line, on the dyno or in the world of hill climbing, the 2000 YZ250 wouldn’t always sit on top of the throne, but if you toss in off camber corners, ruts, downhills and half-throttle situations, the YZ shines. It has an acceptable power setting for almost every situation. That is good. Very good! While the 2000 Yamaha YZ250 is faster than the ‘99 YZ, it’s still not an eye-watering, arm-dislocating, fence-post-blurring machine. The ‘00 engine is slightly better on the bottom, noticeably improved in the middle and a smidge better on top. 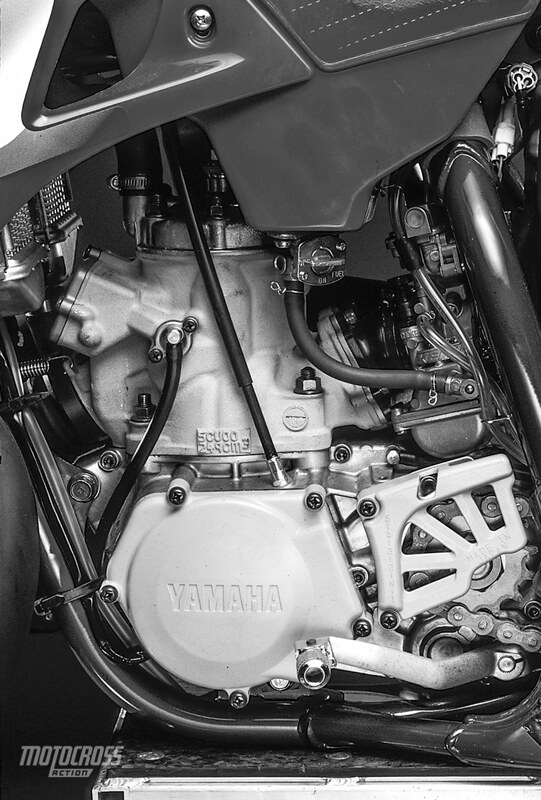 In no way does the new engine obsolete the old–but it is a seriously improved version of Yamaha’s current crop of usable, broad and predictable powerbands. 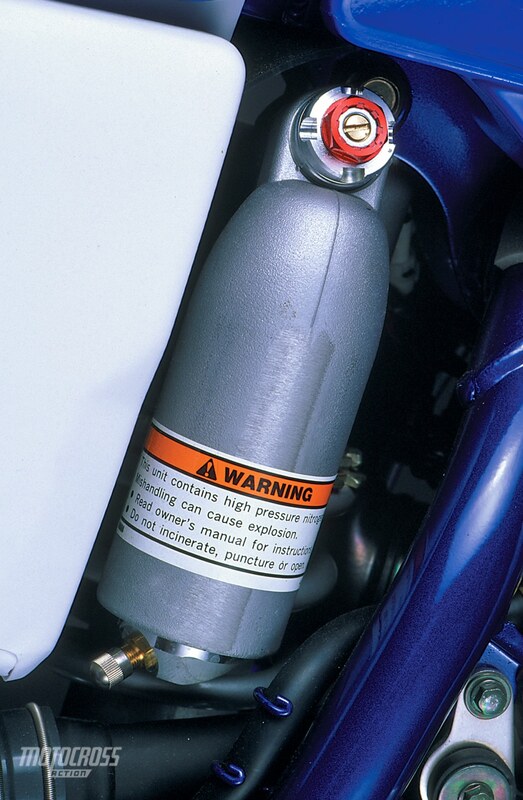 The 2000 YZ250 engine was not eye-watering fast, but it produces a smooth easy to use power band. QUESTION THREE: IS THERE A DOWNSIDE TO THE YZ POWERBAND? No. Ohh, if you want to be picky, the YZ250 engine doesn’t have the snap, crackle and pop that convince the brain that the engine is rockin’. The perception of speed means a lot to a racer–and the Yamaha YZ250 doesn’t seem very fast. But, in truth, the 2000 YZ250 is covering ground at a competitive speed without the visual or aural effects. The YZ250 doesn’t have a weak spot. There is no situation on a race track that the Yamaha doesn’t have an answer for. It can be putted. It can be revved. It can be torqued. It can do tight turns at a quarter throttle. It can do long straights at full tilt. It’s a do-it-all engine. QUESTION FOUR: HOW GOOD IS THE YZ250 ENGINE? 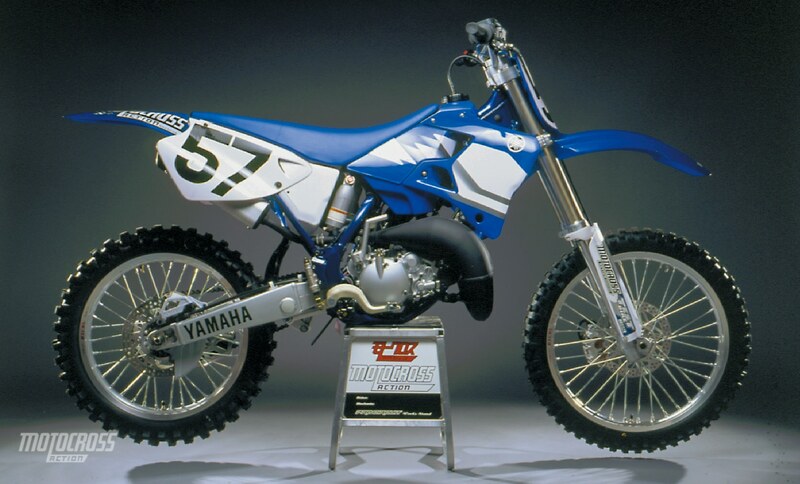 In essence, this is the 250 version of the YZ125. It may seem like blasphemy to say that the YZ250 mimics the YZ125–but it does. The YZ125 has an almost perfect powerband: some bottom, a strong middle, and adequate over-rev. Amazingly, the 2000 YZ250’s list of attributes is identical to the YZ125’s: it picks up smoothly off the bottom; the midrange is effective without being brutish; and, while, the YZ250 doesn’t shriek on top, it has adequate over-rev to go with the flow. It is the best all-around engine in the 250 class. It’s no secret that Yamaha borrowed Kawasaki’s carb–including the spray nozzle, Throttle Position Sensor and KX accouterments. 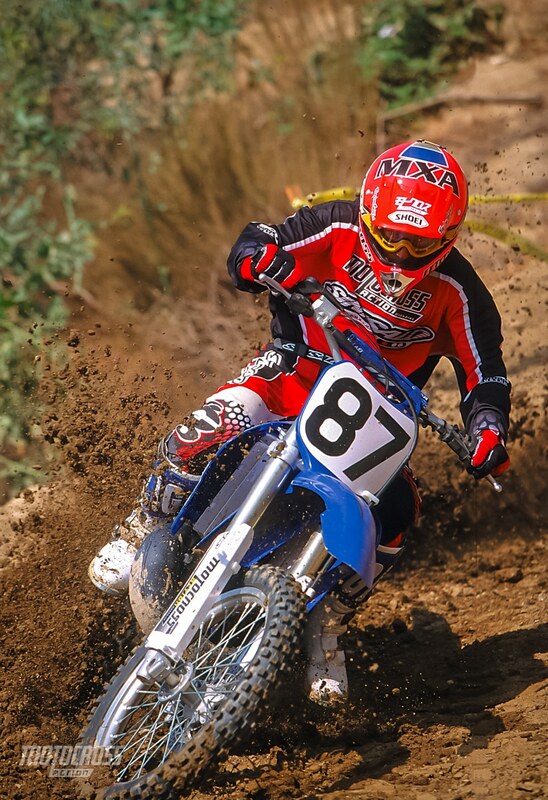 We hazard a guess that the carb and ignition are 100 percent responsible for the YZ’s power gains. We ran the stock jetting, but were never completely happy at our sea-level race tracks. The bottom seemed a little ratty (but the air screw had no effect on it) and occasionally we’d detonate on top. Weather conditions played a part in this, so carrying the slightly richer main, leaner Power Jet and pilot that come in the spares kit would be a good idea. In the end, these are the settings we ran. We ran it stock. The broad powerband has enough oomph to pull the bike out of slow turns, and the stock gearing magnifies whatever over-rev the YZ has. If we were racing on tight tracks or in deep loam, we might be tempted to add one tooth to the rear. QUESTION SEVEN: WHAT ABOUT THE REAR SUSPENSION? Buy it. Roll it out of the show room. Live happily ever after. 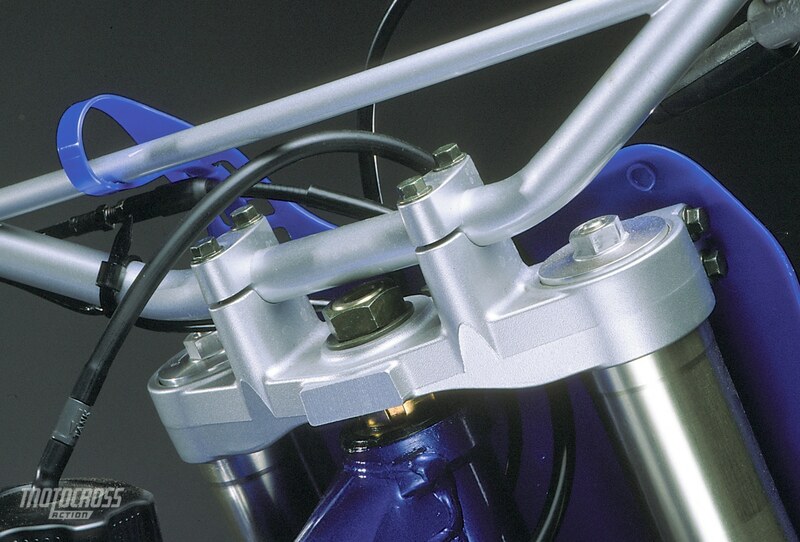 Yamaha didn’t change their linkage, rising rate, swingarm length or shock mounts for ‘00. As a result, the Yamaha R&D department only had to concentrate on dialing in the shock. They weren’t working with the unknown quantities of a new system, but simply refining a known one. And they did refine it! The MXA wrecking crew did little more than click the adjusters a couple of times. It works and it works well. Even better, it doesn’t need a stiffer shock spring (unlike almost every other bike sold in ‘00). 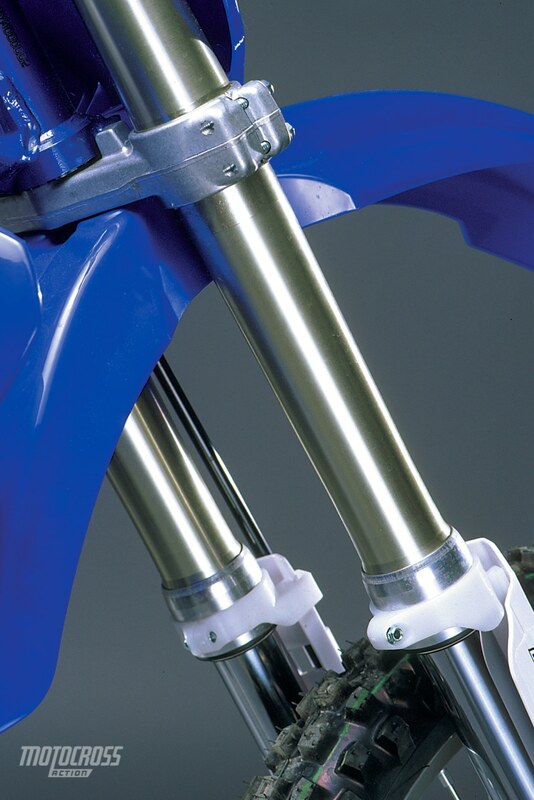 The Kayaba YZ250 rear shock. QUESTION EIGHT: IS THE SHOCK BETTER THAN LAST YEAR? It sure is, and with good reason. Just like the carb, the YZ250’s new rear shock came directly off of last year’s Kawasaki. Yamaha did revalve the shock to lessen kicking under deceleration and improve suppleness over chatter bumps, but without making the same progressive-rate spring mistake that has stymied the shock on the KX. Notes: Yamaha’s high-speed compression clicker (the large dial) is very sensitive to adjustment. Make small (1/8th turn) changes. Use the high-speed adjuster to set the bike’s fore/aft bias at speed. Yamaha turned down Kayaba’s new bladder technology in favor of an improved version of last year’s fork. Yamaha’s 2000 fork works better than last year’s fork, but better still, the Yamaha’s non-bladder fork is dialed in better than any of the current crop of bladder forks. We had a few problems with the 2000 YZ125 fork (we had to run a stiffer fork spring and lower oil height), but the YZ250 fork was flawless for most riders. A very good fork. The Kayaba forks were great than and are still great now. Notes: We ran the stock forks springs without complaint. If you race on Supercross-style track or hit bumps head-on, you may want to go with a stiffer fork spring. But, for the majority of riders, the stock YZ250 springs (front and rear) are home runs. The MXA wrecking crews loves the YZ250 engine because it is an integrated design–each part of the powerband works in conjunction with the next. The same holds true for the chassis. There isn’t a single aspect of the YZ250 that is a standout, yet, the complete bike is a seamless blend that adds up to a terrific package. The handling is flawless. Not perfect, but not marred by any flaws. It’s a do-it-all chassis. 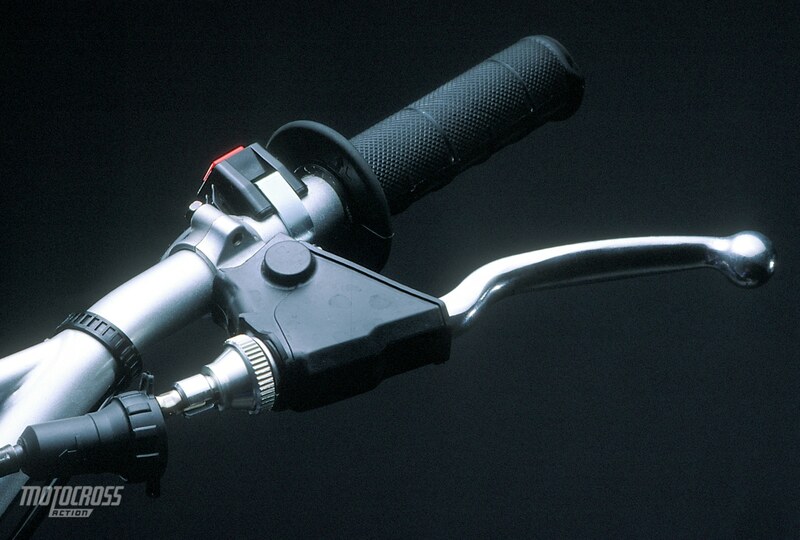 (1) Front brake lever: What was the guy who designed this brake lever thinking? We don’t need complicated, hard-to-adjust, multi-tool, front brake levers. Repeat after us–less is more, less is more, less is more. (2) Hand holds: What hand holds? How are you supposed to pick this thing up? (3) Brake hose: Believe it or not, Honda has a patent on running the brake hose directly to the front caliper. Yamaha should break down and pay Honda whatever they want. Yamaha routs the brake cable under the fork leg via a circuitous route. (4) Graphics: The decals peel away on the first ride. (5) Warning labels: Lawyers demand that Yamaha litter the front and rear fenders with warning labels. We accept that we live in a litigious society, but does Yamaha have to use the best glue in the universe to attach these decals? We wear out fingernails removing them. (6) The white airbox: It looks nice in the showroom and grungy in use. Yamaha claims that the air in the airbox runs as much as three degrees cooler (compared to with the old black airbox). Cool air translates into horsepower. (7) Clutch: It’s vague. Lever play changes constantly during a moto. The clutch had a vague feeling to it, although we liked the on-the-fly adjuster. (1) On-the-fly clutch adjuster: It works. Turn it forward and the clutch gets tighter. Very sweet. (2) Radiator wing: Yamaha beefed up the plastic on the rear corner to keep the new radiator wings from hooking on riders’ legs (but some riders still get snagged). (3) Front tire: Last year’s atrocious 739 front tire has been replaced by the new 739FA. It’s an improvement. (4) Tuning fork: Yamaha was originally a piano company. The tuning fork logo on the radiator wing is a nod to their roots. (5) Sub-frame: It’s made from very trick extruded aluminum. (6) Triple clamps: Finally, the bars have been moved out of our laps (and the lower triple clamp has been widened for more grip). If you’re looking for a bike that needs no after-purchase tweaking, has the most usable powerband on the track and has excellent suspension–this is it. Why you would be looking for anything else is a puzzler.